A delightful swirl of flowers and fabrics and beautiful colors. This fall I took a detour from my usual pattern making and created a sustainable fashion collection. I still kind of can’t believe it myself! I’m going to post a 3 part blog series about the runway show I organized, my design process in creating the collection, and my reflections about the process. Keep an eye out for parts one and two! I spent a lot of time in the spring sketching and thinking about fabric. The whole thing evolved pretty organically from there. I ordered swatches, I sewed some test garments, I drafted patterns, and I thought about my studio practice and what I might like to incorporate into this collection. By mid summer I was fully immersed, working through design issues and challenges in the same way my students do in class. It felt good to be engaged in that experience and gave me a new appreciation for their hard work and thought process. As an artist, it also felt really good to be creating things from some sort of compulsion inside me. And it felt good to do so with the intention of crafting a thoughtful expression of fashion for the future. Perhaps as strong as my desire to create is a need to collaborate. As I worked on pieces for the show, I started reaching out to folks I admired and who’s creative vision through design I felt a kinship with. As I connected with each person, the collection evolved. I decided to take an editorial approach, styling my pieces with items from a number of designers and boutiques I had decided to collaborate with. 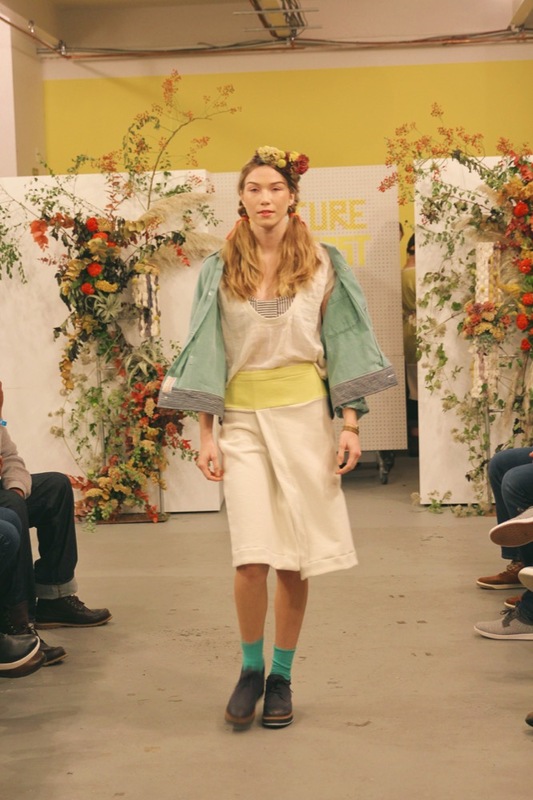 Since a fashion show only lasts a matter of minutes, why not build in an experience? How could I bring together folks interested in slow fashion to spark conversation and grow community within greater Boston. So I decided to grow the event from a runway show to a whole slow fashion marketplace, or exchange. 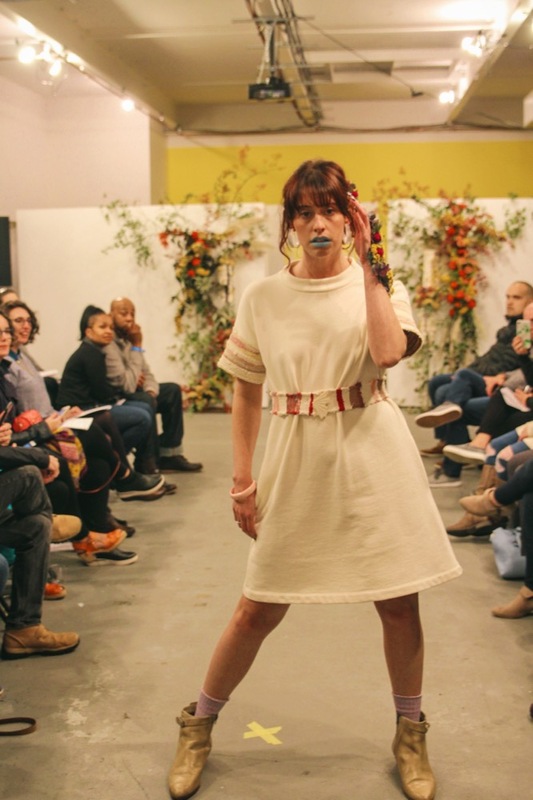 Several of the designers and boutiques who provided pieces for the runway show set up their wares and chatted with slow fashion enthusiasts all night. It was wonderful to see people making connections and meeting new friends. I had a killer line up of vendors, including Slow Process, Practice Space, Dyer Maker/Craftwork Somerville, Nathalia JMag, Peston, and Hot Foot Vintage. When it came time for the runway, the reality of what had been crafted hit me. I told my models, “it’s the apocalypse! But, like, a good one where nature reclaims the earth and everyone creates fabulous looks from reclaimed materials!” Sometimes the real core of a project doesn’t reveal itself until after it’s come into being. It’s amazing how that stuff works. I think this story really crystallized as my MIL Sheryl (of Thistle and Bone Floral Design) was finishing up the amazing floral set pieces, made from a variety of flowers, greenery, and fabric scraps entwined around steel tower-like structures. The day of the event is a blur. I can’t even understand how it came together but there was definitely a bit of magic in the air. Each person who participated filled a unique and important role and it was wonderful to see each persons unique ideas converge into a fun and vibrant expression of fashion. Can you tell I’m already feeling nostalgic about it? What can I say, I’m a softie. All the models wore either borrowed, thrifted, or their own shoes. The bright teal and lavender socks are all vintage deadstock from the 80s. All of the jewelry not made by a collaborating designer was also thrifted. The floral head pieces, earrings, and ‘tattoos’ were also created by Thistle and Bone Floral, who shared leftover flower bits with my amazing hairstylist, Brianna Signor and my makeup artists, Kayla Hall & Liz Collins. I used a limited number of textiles in this collection, including both new and vintage fabrics. I created tops from a vintage cotton blend seersucker and both tops and dresses using an antique embroidered table cloth. My main fabric was a domestically produced (Texas grown cotton, knit in North Carolina) organic heavyweight french terry. It’s truly one of the coziest, squishiest fabrics I’ve ever worked with. Amy Lou Stein (Dyer Maker/Craftwork Somervillle) helped me create the most amazing color palette using natural dyes. I tried my hand at indigo, tea, and avocado. 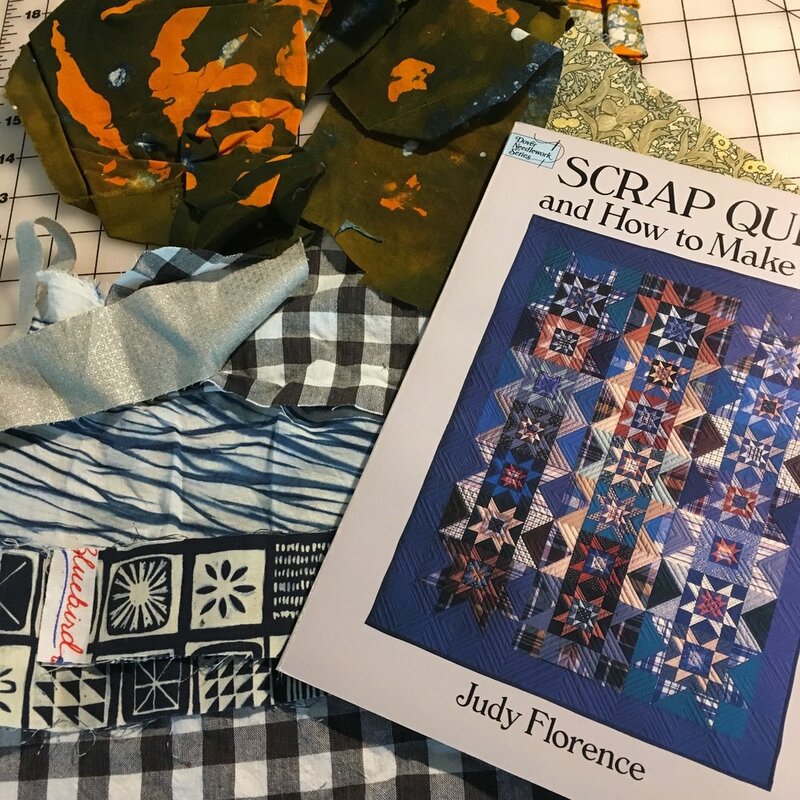 She dyed fabric and felt using weld, brazilwood, as well as creating amazing ‘prints’ by combining Sumac (tannin) soaked fabric and rusty objects, including a rusty, abandoned Somerville DPW snow shovel. I also created my own textiles, including felt using wool from Tree House Farms and ‘rag rug’ inspired fabric & belts, woven using scraps from my studio and from cutting out other pieces in the collection. I also embroidered a few pieces using vintage crewel wool that I’ve collected over the years. I used so many of my favorite techniques in this collection! Natasha wears a bomber jacket made from organic cotton terry & ‘rag rug’ fabric. Shorts were sewn using the wrong side of the terry and an ingio waistband. Her tshirt is silk, rust dyed by Dyer Maker. Her wooden bangle is by Non Issue Studio. Viviann wears a mock neck sweatshirt tee with ‘rag rug’ sleeves. Her skirt is by Nathalia Jmag and her bracelet is by Peston. Adaline wears a vintage seersucker embroidered tee, with a long sleeve sweater by Dyer Maker and pants by Miranda Bennett Studio, care of Practice Space. Rachelle wears a vintage seersucker embroidered tee, with a vintage button up from Vivant Vintage, Skirt by Ilana Kohn care of Practice Space, and collar jewelry by Peston. 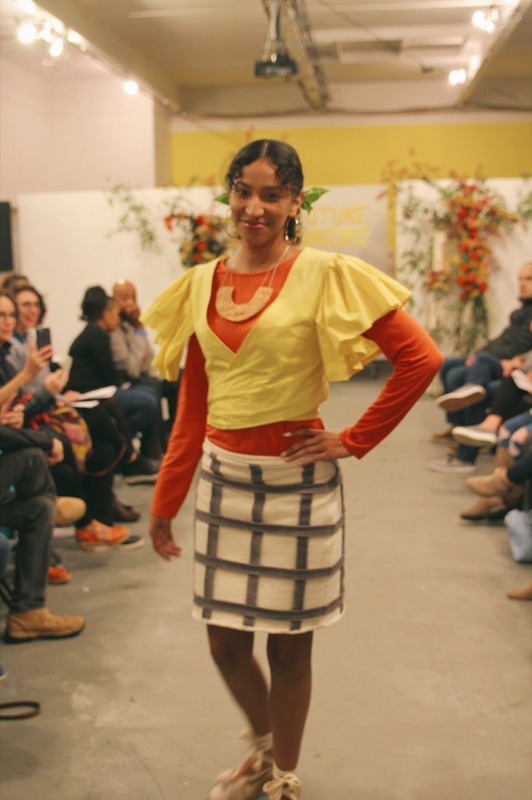 Sylvea wears a tee dyed terry mock neck crop top with rib knit sleeves and a terry skirt with a check pattern made from fabric scraps. She also wears a Dyer Maker silk velvet eco printed scarf and a segmented wooded bangle by Non Issue Studio. Christa wears a terry mock neck dress with ‘rag rug’ sleeves and matching handwoven belt fastened with a vintage brooch. Angela wears an dress made from an antique embroidered linen tablecloth. The under dress is made from orange terry knit (a last minute gift from a friend helping me to finish sewing my collection. It had been in her stash for ages.) and was sewn up just days before the show to go under the other piece. The belt is cotton twill, hand embroidered with crewel yarn. Earrings are by Peston. Natasha wears a vintage seersucker embroidered tee, cotton gauze scarf by Dyer Maker, and pants by Rachel Craven care of Practice Space. Her wooden bangle is by Non Issue Studio. Dariana wears a cotton terry skirt with a check pattern made from fabric scraps and a handmade felt necklace. The yellow top is by Nathalia JMag (dyed with turmeric) and the long sleeve undershirt is secondhand. Sierra wears a cotton terry top with indigo and weld dyed color blocking. Her skirt uses the reverse terry with a rust/tannin dyed trim. Her necklace is made by Tree House Farms and wrist scrunchy is care of Practice Space. Jillian wears an indigo terry skirt with reverse terry stripes made from scraps and a shirt made from an antique linen tablecloth. Underneath she wears a mock neck tee from Vivant Vintage. Her indigo velvet scarf is by Dyer Maker and her earrings are by Peston. Lael wears a french terry mock neck tee with a ‘rag rug’ woven panel and high side vents. Her skirt is terry dyed with iron and tannin. Viviann wears a terry faux wrap skirt with a weld dyed waistband and a scoop neck tank made from an antique embroidered tablecloth. Her jacket is made by Slow process and her striped bralette is by Nathalia JMag. Sylvea wears a cotton terry tee with an iron/tannin rust print and an Ilana Kohn skirt care of Practice Space. Adaline wears a terry tee with weld dyed side panels and a terry pencil skirt with an indigo waistband. Her leggings, backpack, and wrist scrunchy are care of Practice Space. Her necklace is by Peston. Christa wears a terry faux wrap skirt dyed with avocado. Her t-shirt is by Slow Process (tea dyed by me) and her bleached, cropped flannel is by Emmy Ember. Sarah wears a weld dyed terry dress with reverse terry accents and a ‘rag rug’ woven belt. The jeans are her own, handmade by the model herself! Her earrings are by Peston. Rachelle wears a terry tshirt dress with indigo neckband, avocado dyed sleeves, and brazilwood dyed wool appliques. Mia wears a cut out sleeve terry tee dyed with weld and avocado. 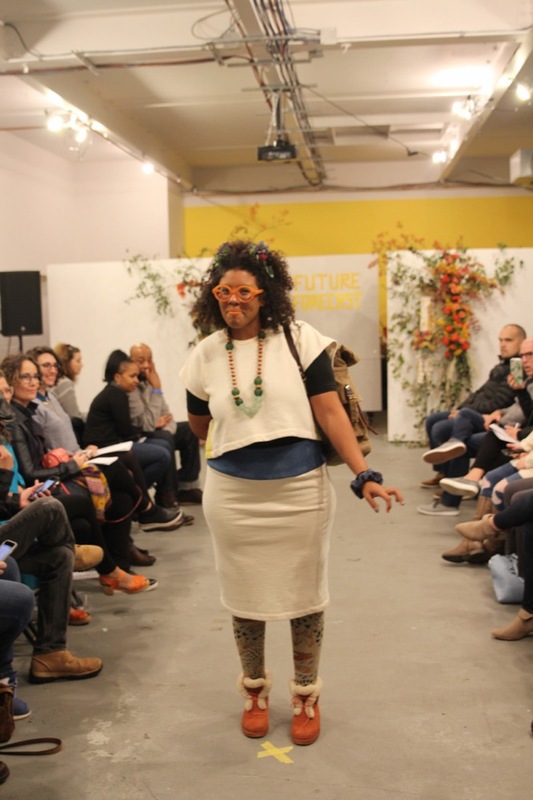 Her long sleeve sweater is by Dyer Maker and the pants are by Ilana Kohn care of Practice Space. Her earrings are by Peston and her bangle is by Non Issue Studio. Mckenzie wears a terry mini dress with avocado and indigo dyed neck and sleeve bands. Her dress is embelished with vintage crewel wool embroidery and felt applique. I think something in my last post flipped a switch inside me that made me reconsider blogging. This is something that you always think is going to happen but never does. And in all honestly, I'd imagine my newfound enthusiasm will probably be short lived. But who knows? Let's go for it. A few years ago, Karen Templer (of Fringe Supply Co.) started up an 'event'* called Slow Fashion October. It's easy to get wrapped up into an entire paradigm shift in terms of your wardrobe for the sake of participation, but I also know that in general my process is slow and calculated, sometimes too slow for even a slow fashion month. I think I live a slow fashion life. However, I think having an opportunity to highlight my slow fashion pursuits for a month is a good opportunity to share my experiences (and challenges!) with others. * while the verdict's out for me on these social media based 'events', I do love a collective call to action. It creates a sense of community in a realm (the digital one) where it's easy to feel alone or isolated. constantly scribbling wardrobe plans and ideas in notebooks. I've been a slow fashion (and a slow most things, really) advocate for many years. From conversations about the issues within manufacturing supply chains to the psychology of the American fashion consumer, it's rare that my mind isn't contemplating a more thoughtful, meaningful way of interacting with soft goods. So in many ways, every time 'Slow Fashion October' comes around, I get a rush of excitement and concern that I should reign back in my business pursuits and focus on these greater issues. I don't know about you guys, but I'm a deep thinker. I love to analyze and evaluate and think about the why and how of our current situation. When it comes to slow fashion, I feel like my mind is always asking, "how can I sew more thoughtfully, have a wardrobe that works better, and find the answers to big questions about fast fashion." I've come to realize that for me, it's sort of Slow Fashion whenever. The idea of pushing aside projects to dig my heels feels weird when my mind is always steadily pushing in this direction. My slow fashion project for last year is still not finished (though I made some good progress!) but I've decided that's okay. It's all part of a life that revolves around clothing and fiber. So instead, I'm going to declare two big, continuous goals for whenever. The ever evolving practice of evaluating and curating my clothing collection. Being a champion of, creator of, or facilitator of thoughtful fashion in whatever shape and form it has and will continue to take. In this blog post, I'm going to focus on the first goal. Can you tell I love making lists and setting intentions? I'll save part II for a later blog post. I wish I could pinpoint a specific turning point or 'wardrobe epiphany' over the last few months, but the reality is less glamorous. I feel like I've been considering and re-considering and evaluating and troubleshooting my wardrobe for years. One thing that really strikes me after all this thinking is that I still periodically have trouble getting dressed in the morning and putting together outfits. And, though I've spent a lot of time thinking about it, I haven't quite figured out why. I'm still searching for the formula that will give me a magical pantry of wardrobe staples that allow me to effortlessly throw outfits together with panache and sophistication. Does it exist? I don't know, but I enjoy trying to find it. 1. You have to not get bored easily. 2. You have to have a certain level of life experience that has either crystallized your visual identity via presentation and/or made you give less fucks about how you look. While I feel like I'm slowly getting closer to the later (Hi houseplant earrings! ), the former is the issue. I go through phases with clothing. I also love to sew and that itself presents a problem for the 'capsule uniform'. Even though I'm perhaps not a good candidate for the 'uniform' approach, I do have the knowledge and ability to make my wardrobe (evolving as it is) as thoughtful, low impact, and effective as possible. But the allure of the uniform still lingers. Efficiency is so wildly appealing to me, but so is looking fab on a regular basis and sewing for pleasure. The three often seem at odds, especially when you throw a politically minded aversion to waste, excess, and consumption into the mix. So far, I've figured out a lot of things that form the basis of a uniform, like the fact that I love wearing earth tones, that I have specific shapes that I like. I also know that generally, I go through phases of loving particular garments and wearing them over and over. I also have found that, though having a sewing business cuts into my personal sewing time to an unpleasant degree, there is something to gain from having to wait. I've started making tiny sketches of hopefully future projects and storing them with my fabrics. Time is a great editor. I've started to notice that either having a smaller wardrobe or cycling out items makes for a clearer vision for me in terms of how I want to dress and feel good. Many people put this same idea into practice very successful, including Karen herself as part her Slow Fashion October project this year. How to deal with change and turnover in an equally thoughtful way. So, if we've come to terms with the fact that our style WILL change and, as a result, necessitate the relinquishment of unworn items, we can start to approach the issue of 'what to do with what you don't want' in a thoughtful manner. You all know my love for clothing swaps. That's one option. I've also realized that, since I only wear natural fibers, I can compost my old & damaged clothing or scraps! (Clothing company Elizabeth Suzann did a field test, composting scraps from their garment production, and was quite successful!) There are also many more impactful places to donate your clothing than your usual thrift store, like groups who provide free professional clothing to folks applying for jobs or relief organizations who need clothing (because our climate is in a crisis and many have lost everything to natural disasters). I outline some other uses for discarded clothes and fabric in my post about clothing swaps too, if you're interested. One of my favorite ways to recycle old clothes and scraps etc is by quilting. If I can cultivate a sustainable clothing practice, it will allow me to sew to my hearts content, follow the winds of my changing style, and not feel like I'm having a negative impact on the world around me. Next time, more on bringing thoughtfulness outside of your personal sewing/dressing practices and into your community! Do you have methods for (or struggle with) how to negotiate a love for fashion/changing style and being responsible about how you consume/dispose of items in the process? Do you constantly think about slow fashion or do you take the opportunity to do so during Slow Fashion October (or other social media calls to action like Me Made May)?